It was brought to my attention today that some people may have encountered problems while travelling to last night’s game with Maritimo, when trying to use the Magpie Mover card on Stagecoach buses. Apparently, drivers have charged fans travelling within the allotted 3 hour period, claiming that the ticket only works for Premier League games. 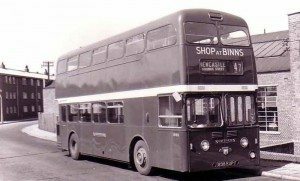 “Valid for the whole 2012/13 season, it allows you to travel to and from first team home games from anywhere in Tyne & Wear for up to 3 hours before and 3 hours after the match”. No mention then of any ‘league match only’ clause. I contacted Stagecoach and, despite being originally told the same line about league games by the first person I spoke to, was then escalated to someone who agreed that all cup games were inclusive, with only pre-season friendlies or testimonials being exceptions to the pass’ capabilities. If anyone has had these problems at last night’s game you should call Stagecoach on 0191 228 8900 and ask for Eric Finlay, who confirmed the validity of the pass to me today. He also clarified that all staff should be aware of these conditions. I would urge anyone to get in touch if they have encountered difficulty as this pass (which is a cracking deal at £10 for the season – Season Ticket Holders can buy a Magpie Mover Here) is clearly advertised as serving this purpose and the attitude of some public transport employees in mis-enforcing the rules has been questionable to say the least in the cases referred to me. If someone was travelling without any change would they have been thrown off the bus in spite of having a perfectly valid travel pass? I haven’t heard any complaints against Arriva or Nexus but please get in touch if you have had a similar misadventure. I am loathe to suggest that the football loyalties of some bus drivers may be a factor in this problem but suffice to say our friends down the road don’t take kindly to our European adventure. I realise the timing of this isn’t ideal with the home group stage games now completed but hopefully the situation will be put to bed by the time of the next round/FA Cup. I can confirm that the Magpie Mover ticket was valid for last night’s game and that the bus companies have issued instructions to staff with the details. “I’m sorry to hear that there’s been a problem and, having spoken to Stagecoach, I know that they are aware of one customer having an issue with using their ticket last night. The individual driver has been identified but, to ensure all drivers are absolutely clear on the validity of tickets, the notice will be re-issued at both of their Newcastle depots. I’m assured that the customer has had a prompt response and apology”.